09/01/18 Patrick Waksmunski / Appalachian v Penn State / Penn State cornerback Amani Oruwariye (21) breaks up a pass intended for Appalachian State wide receiver Thomas Hennigan (5). 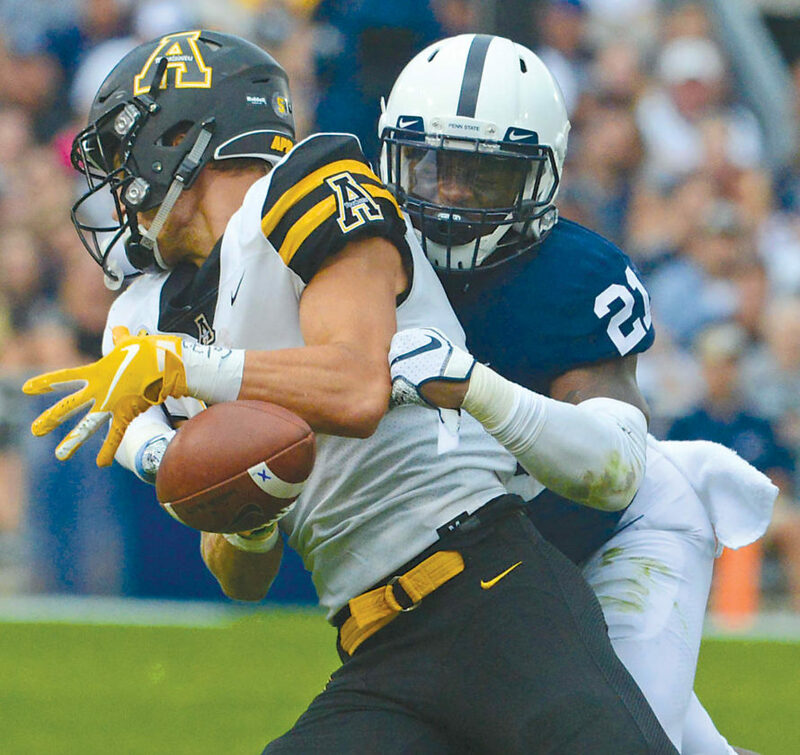 Play of the game: Nittany Lion cornerback Amani Oruwariye intercepted App State quarterback Zac Thomas in the end zone on first down from the PSU 15 in overtime to clinch the victory. Offensive player of the game: Thomas completed 25-of-38 for 270 yards and two touchdowns. He was not intercepted until the game’s final play. He also rushed 15 times for 43 yards and another touchdown. Defensive player of the game: Oruwariye not only came up with the key interception, he made seven unassisted tackles – most on either team – and forced a fumble. Most telling statistic: The Mountaineers outgained Penn State, 451-434. Most deceiving statistic: Penn State racked up 204 yards rushing but lost time of possession, 32:28-27:32. Hidden statistic: App State stayed in the game despite being penalized nine times for 100 yards compared with the Lions’ two for 10. Best run: Ricky Slade burst up the middle and strongly punctuated a 26-yard touchdown, extending the Penn State lead to 24-10 with 2:41 left in the third quarter. Best pass: Lot of choices. But after the Lions knocked out Thomas for a play in the fourth quarter, App State backup QB Peyton Derrick entered facing fourth-and-2 at the PSU 24. He lofted a perfect 22-yard throw at the sideline to Dominique Heath, setting up a touchdown that pulled App State within 24-17 with 11:17 remaining. 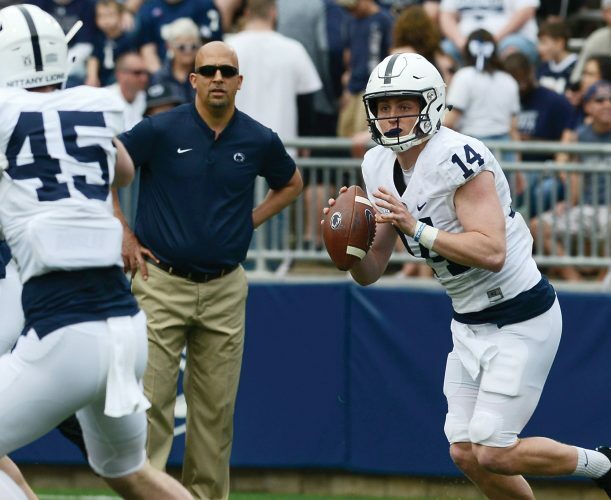 Worst pass: Trace McSorley, not overly sharp early, had Juwan Johnson open for a touchdown in the second quarter but air-mailed him. Best return: Down 38-31 with 1:39 seconds left in regulation, Penn State’s K.J. Hamler’s 52-yard kickoff return, after he twice initially appeared like he would take a knee, let PSU set up at the App State 48. Could well have been the play of the game. Best catch: On fourth-and-2 from the App State 40 in the last minute of regulation, Brandon Polk came up with a clutch 10-yard reception for a key first down that set up the game-tying score. Catch it, will ya: Juwan Johnson dropped an early pass in the flat in the first quarter and had a fourth-down, drive-killing reception go through his hands in the second quarter. Hold it, won’t ya: Penn State did not fumble. Best tackle: App State cornerback Tae Hayes dumped a leaping Miles Sanders in the second quarter. Best block: Will Fries blew open the hole on Slade’s touchdown run. Best hit: Antonio Shelton, a 310-pound defensive tackle, decked Mountaineer punt returner Clifton Duck late in the first quarter. Impressive effort for a big fella on the punt unit. Best kick: Appalachian State punter Clayton Howell had a 40-yarder check up at the Nittany Lions’ 4 late in the fourth quarter, flipping field position. Worst kick: Didn’t see a really bad one. Worst penalty: After stopping the Lions on third-and-short on their first possession, forcing an apparent punt, Appalachian State safety Desmond Franklin was nailed with a personal foul penalty, extending Penn State’s possession, which the Lions turned into a touchdown. Best call: Down 31-24 with 7:39 left, App State’s Michael Rubino executed an onside kick that the Mountaineers recovered at their 47. Four plays later, the game was tied at 31. Worst call: After coming up with a squib kick with 11 seconds left in the first half, the Lions botched a chance for a long field goal attempt by throwing underneath to Mark Allen, rather than attempting a longer pass or one to the sideline. Worst coverage: The Lions’ kickoff unit did its imitation of the Red Sea as it was split by Darrynton Evans’ 100 yards TD return that tied the game after Penn State took a 7-0 lead. Best effort: The Lions got 168 yards from their three tailbacks — Sanders, Allen and Slade — on 36 carries. 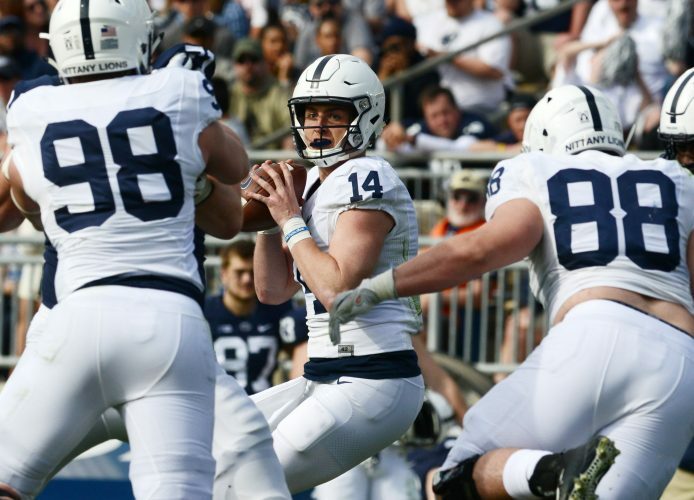 Unsung hero: It’s almost never McSorley, but he once again came through in the clutch by finishing off a seven-play, 48-yard touchdown drive (capped by a 15-yard TD to Hamler) in less than a minute to tie the game at 38 with 42 seconds left. McSorley wound up 21-of-36 for 230 yard, a touchdown and no interceptions. He also rushed 12 times for 53 yards and two TDs. Best moment: Legendary PSU women’s volleyball coach Russ Rose was introduced to the crowd during the first quarter in recognition for his 40th season.